Music Theory – What Is It and Why Should I Care? What is music theory and why should I care? Music theory is a way to explain how music works. Some people explain music theory by comparing it to grammar. Just like grammar helps us to learn the rules for writing sentences and paragraphs, music theory is the rules and structure for the language of music. The rules are not restrictive rules; rather, the rules are the foundation on which the music is built, the structure, or the skeleton, for our music. It is a way of explaining why some sounds work better than others. The ideas that help us understand music and how it is put together is music theory. On its most basic level music theory deals with the notation, structure, rhythm, melody, and harmony of music. Music theory explains how to take the sounds a composer wants and express them on paper. 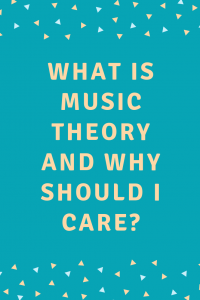 Why should I care about music theory? If you are learning to play music, knowing some basics of music theory will be a big help to you! Can you look at a piece of music and understand what all the black stuff on the page means? That is music theory. Knowing music theory will help you learn your music faster. At some point you need to learn your music by reading it off the page, not by listening to someone else play it for you. If you know music theory you can read the notes off the page, understand how the notes should be played, and understand why they work together. The better you can do that, the better you can learn new music. Knowing music theory will help you memorize music more easily. Sooner or later, if you keep taking music lessons, you will have to memorize some music. The more you understand how the music is put together, the easier you will be able to memorize your music. You can look for patterns in the music, you can understand what the music is doing. Can you tell if a group of notes is just a scale in disguise, or if it is a chord with the notes played one at a time instead of all together? Understanding the logic behind the music will make memorizing your music easier. Knowing music theory will make you a better sight reader. Have you ever had anyone place an unknown piece of music in front of you and tell you to play it? Can you do that without panicking? Music theory to the rescue! If you have some understanding of music theory, you know what to look for before you start to play. You know to check the key signature and the time signature. You know to glance through the music and look for patterns. Music theory helps you look for all the clues that make playing the piece a little bit less intimidating. Music theory helps to improve your improv. If you want to improvise on your instrument knowing some music theory will help you do a better job! Do you know what key you’re playing in? Is the piece major or minor? What chords are you using? Knowing how to figure out all those things helps you be a better improvise. Some basic music theory knowledge helps you help your child. Are you the parent of a music student? Do you know anything about music? If not, learning some basic music theory will help you help your child. You can listen to them play and hear that something is not quite right, but can you help them find what they are missing, what they are getting wrong? Learn some basics along with them, and you can help them find their playing errors. Learning some basic music theory will help beginners learn music better and faster, it will help more experienced students understand their music better, and it will help parents be able to help their children. Stop by next week, and we will learn some of the basics! Author amusicmomPosted on September 21, 2018 Categories Music TheoryLeave a comment on Music Theory – What Is It and Why Should I Care? Did you know? Just like the history you learn about in school has different time periods, or eras, so does the history of music. And each music history era has different characteristics and different changes in how the music was written and played. Even though the first music history era starts in 500 A.D., that doesn’t mean there wasn’t any music before that. Music existed long before that time; it just wasn’t classified into a specific time period for music history. So let’s look at these different time periods and some very basic characteristics for each one. This period of music history corresponds to the Middle Ages, about 500-1400. Most music then was vocal music, written to be sung in the church. There were not very many instruments available. The main instruments were the recorder, the trumpet, the bagpipe, and the shawm (somewhat similar to the oboe). During this time people were just beginning to develop the ideas of how to write music on paper. 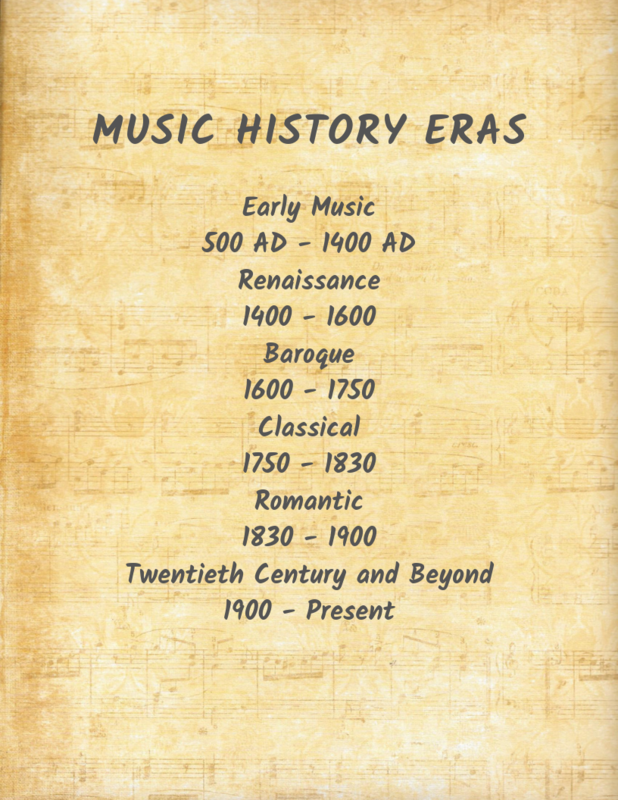 This music history era was the same time as the Renaissance era in world history, from about 1400-1600. During this time people explored new ideas and new worlds, and discovered, or rediscovered, new things in art and music. Most of the music was still vocal music, but it was not all just for use in the church any more. Also, the printing press was developed during this time, so people were able to print and distribute music. The Baroque period of music history happened about the same time as the Pilgrims, exploration, and colonization (1600-1750). This was the same time period that the American colonies began. During the Baroque era composers wrote much more instrumental music and non-church music. The first versions of the modern orchestra were started. Composers also started writing operas and oratorios. The Classical period of music history happened at about the same time as the American Revolution, the French Revolution, and the Age of Enlightenment, about 1750-1830. During this time composers started writing string quartets, sonatas, and orchestral symphonies. More instruments were added to orchestras. Also, the modern piano was developed and popularized during this time. The Romantic Era lasted from about 1830-1900, about the same time as the Industrial Revolution. The music from this time featured intense energy and passion. Composers tried to express scenes from real life in their music. Musical rules of the past had to be rethought and changed to support new ideas of writing music. New musical developments included tone poems, descriptive overtures, major symphonies, dramatic operas, and virtuosic piano music. This era of music history began about 1900 and continues through today. Composers during this time tried to be radical and different, and rebelled against some of the established musical ideas. So, new styles and forms of music developed. Classical music composers included ideas from jazz and folk music into their new music. This era also includes music for film scores and video games. If you want to know a little bit more about music history, check out https://www.classicfm.com/discover-music/periods-genres/. 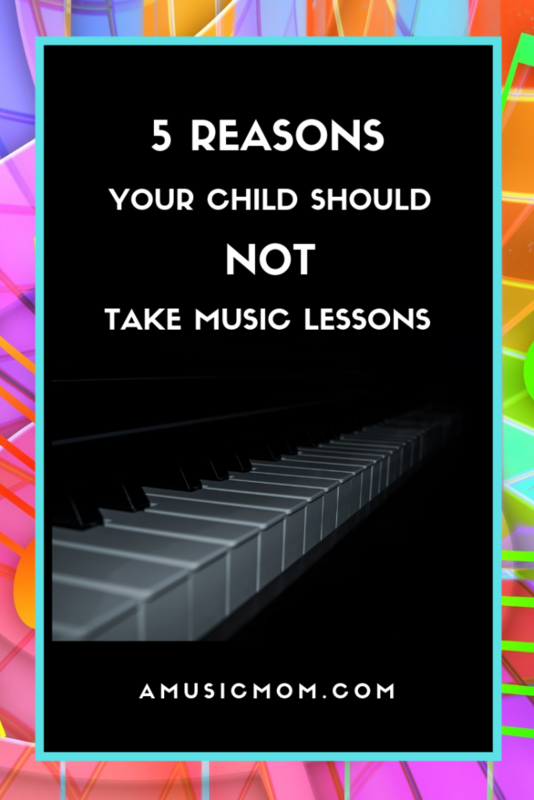 5 Reasons your child should not take music lessons – These may not be what you expect! Thinking about signing your child up for music lessons? Private lessons, or lessons at school? Think again! Don’t get me wrong – I am all for kids learning music. I am all for kids taking music lessons. But, if any of these reasons apply, you might need to rethink your plans. 1. Do NOT sign your child for music lessons just to fill up his after-school activity calendar. You know how it goes – Monday: full; Tuesday: 3:30-Chess Club, 4:30-karate class, 5:30-hmmm, don’t have anything scheduled there, let’s see…piano lessons, that’s it. 2. Do NOT enroll your child in music lessons if you, the parent, have no interest or desire for your child to actually practice. I had a lady tell me once that when her daughter was young she signed up for French horn lessons. The mother couldn’t stand to listen to her practice, so she would tell the girl how wonderful she sounded, and that she didn’t need to practice anymore. Needless to say the girl did not continue with music for very long at all. 3. Do NOT sign your child up for music lessons if you do not intend to make sure she shows up prepared for her lesson each week. That means that you (parent!) have to be sure she has a reliable way to get to the lesson, that she brings her music with her, that she brings her instrument, and that she has practiced at least some during the week. 4. Also, do NOT start music lessons if you aren’t willing or able to provide an instrument for your child to practice on. Hey, I know instruments can be crazy expensive, but there are ways to reduce some of the expense. Rent an instrument. Buy a used (functional) instrument, look for listings for free pianos. Give your child a chance! Supply him with a functional instrument. 5. Finally, do NOT enroll your child in music lessons if you have no interest in long-term commitment. Just like sports, music is not mastered in a semester, not even a year! Be willing to commit to a long-term process and stick with it! Don’t let your child quit the first time he faces a challenge. Persevere!!!! Have anything to add to my list? I would love to hear your comments! Be sure to check back next week for Reasons Why Your Child SHOULD Take Music Lessons. And check back in a couple days for some info on music history and some music theory basics!